Applying makeup is one of my favourite pastimes; it’s surprising what a swipe of lipstick and mascara can do for your confidence. But as fun as makeup is to apply and wear, taking it off is where the fun can wear a little thin for me. I’ll put my hands up and admit that I can sometimes have a slap-dash approach toward makeup removal. And the worst thing is, I know just how much harm I’m doing my skin in the process (basically inviting blemishes, premature ageing and dry skin). Using the same cleanser for your face and eyes is a big no no. And this is no sales jargon, drummed up by skincare brands to sell more products – this is serious business. The skin around the eyes is ten times thinner than the rest of your face, so calls for a much more gentle method of removal and formula. Long story short; if you keep removing your makeup without the soft touch it needs you’ll end up with dryness, irritation and in the long run, wrinkles. One small change now could make the world of difference in years to come – so what’s stopping you? 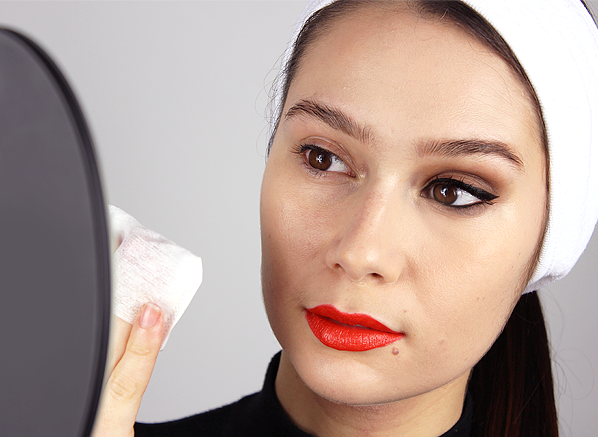 Worried you’ll have to spend more time removing your makeup? Well, you’re in luck because eye makeup removers are specifically designed to remove stubborn mascara and eyeliner, so if anything you’ll remove it all quicker. And, speaking of time; if you’re already using an eye cream, to combat ageing concerns, then you’re undoing all your good work by not using the correct cleanser – convinced yet? A match made in cleansing heaven, this duo is the combination everyone needs to remove their eye makeup gently and efficiently. Firstly, the DHC Silky Cotton Cosmetic Pads are made from delicate silk and tayon, wrapped around layers of 100% natural cotton, so you can rest assured that they’ll be gentle on your eye area. And secondly, the Clarins Instant Eye Makeup Remover is enriched with ultra-fine oils, which melt away even waterproof makeup and cornflower, which soothes, making it an option for even those with sensitive eyes or contact lenses. How to: First things first, don’t pull or rub! The beauty of the Clarins Instant Eye Makeup Remover is that it does all the work for you. 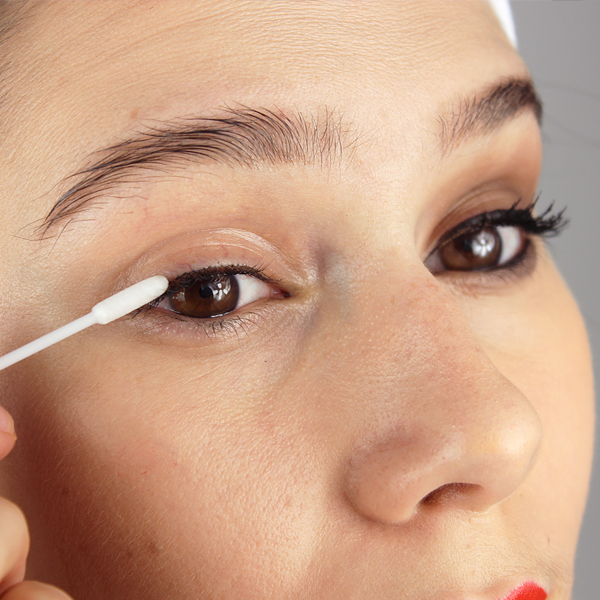 Soak a cotton pad and press it over your eyelid, hold for a few seconds and gently pass over the eye. I know how appealing it can be to just grab a face wipe and rub off all your makeup, but this is no good for anyone, especially your skin! Believe it or not, the best way to remove makeup from your skin, is by breaking it down, layer by layer. So like I said above, the first layer is your eyes, which need special attention. 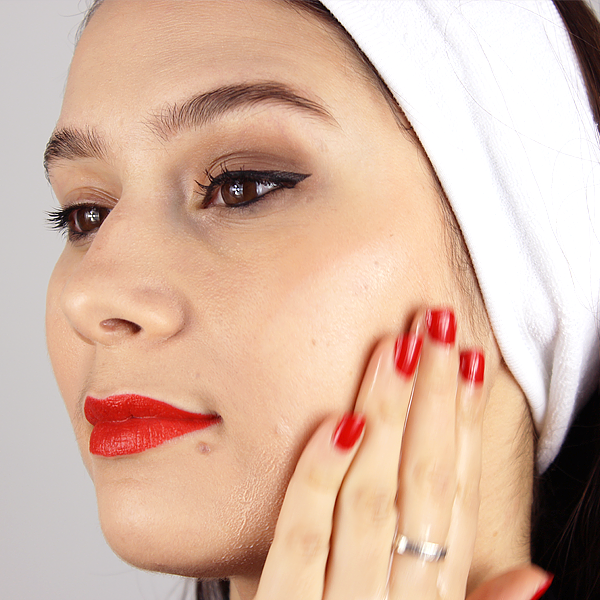 Then next up, is lips (if you’re wearing a bold lip colour). It’s no good creating a big mess of makeup, melting it away all in one go, that’ll only result in makeup being transferred all over. Whether you use a cream cleanser or an oil, target your makeup in sections and you’ll notice firstly that you get it done quicker, and secondly that your skin is left far cleaner. This step is all down to preference, so choose the formula that you and your skin enjoy the most! Whether you like the fuss-free benefit of a micellar water, or the nourishing formula of a cleansing milk, go with what you love (and what works with your skin type) – you’ll be using it everyday after all. Micellar Water: Bioderma H20 Sensibio – fast and easy, this micellar water is a worldwide hit and has options for different skin types too. Cleansing Oil: DHC Deep Cleansing Oil – this award-winning cleansing oil contains rosemary leaf oil and hydrating olive oil, which lift away makeup, dirt and excess oil with ease. Cleansing Gel: Nuxe Reve de Miel Cleansing and Makeup Removing Gel – refreshing on the skin, this cleanser is made up of honey and sunflower and keeps skin balanced and clear. Cleansing Milk: Caudalie Gentle Cleansing Milk – designed to nourish your skin while you cleanse, this antioxidant rich milky cleanser is ideal for someone with normal to dry skin. Cleansing Balm: Darphin Aromatic Cleansing Balm – perfect for all skin types, this indulgent balm turns into a silky, non-oily milk when it comes into contact with water. If you’re in a rush or tired it can be easy to miss makeup and dirt when you’re cleansing, especially along the jaw and lash line. And, unfortunately for us, continuously missing certain areas of the face can lead to (deep breath, please) eye irritation, blackheads, spots, premature ageing, dry lips and dry skin. The solution? If you hadn’t guessed just yet the most efficient way to remove all traces of makeup and dirt is by double cleansing. Yes, double cleansing can add a little extra time to your routine, but when you have clear, healthy skin that’s completely cleansed, you’ll be glad you took that extra bit of time. First Cleanse: First up you should break down all your makeup (as described above). Personally, I find this is easiest and most efficient when using an oil or balm. Heat the formula between your palms and massage onto dry skin and watch your makeup melt away! Second Cleanse: The second cleanse will tackle any makeup, dirt or pollution that’s still clinging on. For this step, use either a face wash that targets a specific skin concern of yours, a micellar water or cleansing milk to remove water-based dirt. Quick Tip: If you struggle to remove eyeliner and eyeshadow from your lash-line, use DHC Olive Virgin Oil Cotton Swabs. They’re created for delicate areas of the face and will make getting to those hard-to-reach places easier than ever. Very gentle on the eyes would recomment to anyone with sensitive skin. This entry was posted on Friday, February 3rd, 2017 at 9:37 am and is filed under Hints & Tips, Make-up, Skincare. You can follow any responses to this entry through the RSS 2.0 feed. You can skip to the end and leave a response. Pinging is currently not allowed.